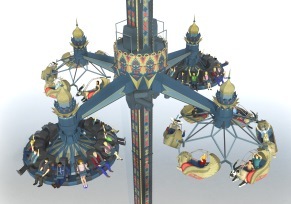 German amusement ride manufacturer Huss Park Attractions GmbH has announced a world first installation at the famous Tivoli Gardens amusement park in Copenhagen, Denmark. Due to open for the 2016 season is a new HUSS® Condor 2GH, the first such ride to be installed anywhere in the world and an attraction that provides guests with a choice of two ride experiences in different types of passenger gondola. To be called Fatamorgana, the new attraction is situated in the oriental area of the park and is heavily themed and beautifully decorated with oriental floral and graphic ornamentation made of nicely painted sheet metal to complement adjacent attractions. The designs and decoration used were inspired by the celebratory oriental architecture of Tivoli and feature careful attention to detail which utilises bright oriental colouring and gold highlights to set a wonderful scene for riders. The gondolas are also a key element of the theming and decoration. Passengers will ride in gilded winged lions and winged oryx flying on illuminated magic carpets which, coupled to spectacular lighting effects throughout the attraction provided by hundreds of LED lights, create an enchanting ‘Thousand and One Nights’ impression. 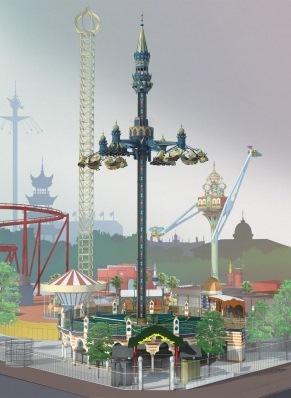 Incorporating hybrid gondolas, the Condor 2GH provides unique ride experiences, offering a choice of soft thrill ride and panoramic ride. Passengers will be taken to a height of 30m above the ground on a structure that will reach in total to 45m. Four arms are attached to the central tower, at the end of which are gyro frames, two of which will carry six, double-seater gondolas themed as lion and oryx while the other two will feature 14 suspended outward facing single seats. During the ride each gyro frame counter rotates against the central rotation while the gondolas also swing outwards as they go round. The attraction provides totally different experiences in either seating option - while the outward facing seats offer a more thrilling experience, the lion & oryx styled gondolas provide a calmer, smoother ride.